I've been reflecting a lot on social media this month & the role it has to play on your mental health. Growing up, people complained glossy magazines were contributing to eating disorders and pressurising young women to look a certain way. Now social media is 24/7 and I worry about how young people cope with the pressure for a perfect selfie. I really worry about the young girls in my life who see these images of 'perfection' and think they need to look a certain way to feel accepted. We're a society that says thank you so much yet 2018 has made me think a lot about what is truly means to be grateful. We say 'thanks' so flippantly that it has lost its meaning in so many ways. My biggest annoyance in life is when people are not grateful for what you have brought to the table - whether that has been emotional or physical support. It's also becoming harder in life to be thankful as we place so much value on physical things such as presents at birthday or Christmas time rather than the time that person has spent with you. I recently travelled to London with the Post Office to attend one of their Digital Drop Ins in association with Google Garage. They carried out research where they found out that 20% of people in the UK don't feel digitally confident. The Digital Drop In sessions were carried out in libraries across the UK to help people to gain more skills & one to one coaching on areas they felt they struggled with. This was aided by amazing Google experts who advised the best ways to solve their problems and up skill - 73% of those surveyed wanted to learn brand new skills! Date night... whether it's with your other half, best mate or mum, I think everyone seems to have a night each week that they know they see a certain person. If you are like me, you're always looking for the latest thing to try out in the city after work or on a Friday night. Confidence... it's something I talk about a lot on my blog. But digital confidence is something that I've started to think about over the past six months. In my almost 8 years of blogging technology has advanced so much. I used to spend so much time working on my blog posts on my laptop and transferring pictures from my SD card to my computer. Now it can all be done from my iPhone! As I get older, my safety and how much I choose to share online has become more important to me. As someone who has lots of digital knowledge I feel like I need to share more about keeping yourself safe online whether that be via the apps, safety measures or what you should or shouldn't share. One in five people do not feel digitally confident. If I think of that in terms of how many of you like to read my posts, it's a lot! 17% of people struggle with smart phones and 21% of people struggle with apps. And we aren't just talking about my mum who I regularly have to give tech advice to (or help her with her wireless printer!). 21% of 18-35 year olds feel uncomfortable with the pace of technology. I get it - I started my blog with this website and Twitter & that's grown to Facebook, Instagram and a million other different platforms. It's hard to keep up! That's why I've partnered with the Post Office & Google for their Digital Drop Ins. I'm heading to London at the end of the month to learn more about getting up to speed with digital confidence. Let me know if there's any burning questions you'd like me to ask the digital Google team by tweeting me @GemmaLEBond. If you live in London & would like to attend (I'll be there too!) please sign up to the free workshop on 31st August at this link. Out of everything in the skincare series, this has been the most requested. As I regularly post heading for treatments on my Instastories (@thatbelfastgirl if you don't follow), I thought I'd finally detail all of my favourite treatments here that I love to keep my skin in tip top condition. I've been going to see Deborah Harper in Helen's Bay for years. Her Yonka treatments are glorious, relaxing and soothing. The Yonka range is an amazing routine for anyone at any age. If you've been following my skin series and want to start into a new range whether you are 17 or 70, Yonka is a great place to start. My advice is to head to see Deborah, get a facial and get a new skin care routine on the go. I find the range is super nourishing and hydrating - it makes your skin refreshed and clean! I love the Le Grande Classique facial - deep cleansing and a massage in one! I've been known to drift off to sleep during this treatment! If my skin is feeling like it needs a refresh, I love to get microdermabrasion. It's basically a deep exfoliator that uses crystals to blast your skin. I've also found that it really helped my acne scars and bumps from my bad teenage skin years. The treatment promotes new cell and collagen production making your skin more plumped and gorgeous! I love it to make my skin feel brighter before an event like a wedding or when I come back from holidays when my skin is a little clogged from my SPF usage. I get my microdermabrasion at Beyond Skin and they often combine this with some LED therapy to help any redness in the skin. I find that I tend to veer to microdermabrasion more in the winter months when my skin definitely is not as vibrant as other times of the year. A course (3 - 6 treatments) of microdermabrasion can really transform your skin whether your concern is fine lines, pigmentation or light scarring. In January this year I had just moved house and job. My skin went completely bonkers and more spotty than I'd been in probably five years. I wasn't eating well, I probably drank zero water and my stress levels were sky high. I headed to my friend Helen at Urban Skin Care where she transformed my skin over a few week using Dermalogica's Bio Surface Peels. Unlike other peels you go weekly and Helen is the queen of extractions meaning GOODBYE black heads and under the skin spots! The combination of resurfacing and extractions helped to return my skin to tip top form. I highly recommend this if your skin is having a moment or you want to get gorgeous for a big day like your wedding. Treatments are definitely an investment but one worth saving for if you want your skin in optimal condition. Start with a treatment once a season to help with the changing weather conditions that can play havoc with your skin and work up from there. Skincare can be a fuss. I get that - that's why I did this series. We are taught growing up to 'cleanse, tone and moisturise' but there's so many products on the market that I understand the confusion about where to start when buying skincare. My skin was good for years - I say good and not brilliant. I had teenage acne, I get hormonal spots - so really, I'm probably like most women. I have what I would call 'normal' skin - I can get a little oily around the t-zone if I've had a long day or dry in the winter if it's very cold. I suppose I never really listened to my skin and what is was trying to tell me until this past year. I feel like I have found my dream trio that has transformed my skin from good to excellent. It's like going from your t-shirt bra into your good push up night out bra - it just takes you to the next level! I think this is a great combo for everyone but particular for people who have been cleansing & moisturising for their whole life but want to take things up a notch. Welcome to my 'Power Three': exfoliate, serum and moisturiser. It's those two little steps before the moisturiser that have added so much glow to my skin plus it feels smoother & makeup goes on much better. Exfoliating is key to helping you get a deep cleanse and remove dead skin cells. I've had some bad experiences with exfoliators in the past that have been too abrasive and damaged my skin. Your ideal exfoliator should make you feel like you've had the best cleanse of your life & not strip your skin. Ideally you should cleanse twice a week for maximum results (although I've been known to do it 3 times a week if my skin has particularly needed it if I've been wearing lots of heavy makeup etc). There's two exfoliators I absolutely adore to keep in tip top shape. Firstly, The Body Shop Vitamin C Microdermabrasion is a great product. It's £18 and as it has Vitamin C in it, it aims to help your skin texture and tone. I found this great to use twice a week as it wasn't too heavy on the skin. My current exfoliator of dreams is Dermalogica Thermafoliant. They describe it as a 'skin polisher' with anti-ageing ingredients. I love this as when it contacts with water it heats up giving you a little bit of the spa at home. I feel this has helped the blackheads around my t-zone a huge amount plus a little goes a long way - a great investment product! One of the most asked skincare questions I get is 'When do I use serum!?'. To be honest, I love serum far more than I love moisturiser. I actually hate anything in cream formula and use body oil on my limbs! Serum is KEY to making your skin balanced and hydrated. Although I have good skin I realised that my skin was dehydrated - despite drinking litres of water a day! This was causing me to look more tired and baby fine lines were appearing around my eyes. A great all rounder for this anything with hyaluronic acid in it - it will help skin to hold moisture and look bouncy! I've tried and tested lots of versions of this and the best I've found is the Irish brand Pestle & Mortar (I get mine in Avoca). It goes on like a dream and I saw results from it really quickly. I also love BYBI's Supercharge Serum - it's great for day and night. It's light enough that makeup looks great on top of it. A product that I've been OBSESSED with is Skinceutials Phloretin CF. It's an antioxidant serum that I use in the morning. I've been reading up so much more about the damage that pollution can do to your skin and this serum combats it head on. It's expensive but I can truly say I've never seen results like I have from this. It has a range of ingredients (many of which I had never heard of until this serum!) and it balances my skin out hugely. I tried not using it for about two weeks and my skin looked so dull and horrible! It's truly a magic product that has smoothed out and perfected my skin. In short - there's a million serums on the market. Start out light and work your way up to the big guns! I personally like to use serum morning & night but if your starting out, try it for bedtime and see how your results go! Moisturiser is the basis of good skincare. Like shampoo, you need to cater a moisturiser to your specific needs. If your skin is dry, go heavier. If your skin is oily, go for a mattifying moisturiser. As I mentioned, I don't love a very sticky moisturiser so I look for lighter formula's that still pack a punch ingredients wise. I love Dermalogica's Calm Water Gel as the formula is so weightless. It's packed with hyaluronic acid and it's great for day and night. Need a skin update? Try the Power Three: exfoliate twice a week and serum & moisturise daily! I use all sorts of different things for toner. If my skin is being sensitive, I head for something like my Evian spray (it's literally water!) or rosewater. Both just help you feel a little bit fresher and brighter post cleansing. The Skinician Purifying Toner is what I head for if I'm a little bit oily so around more hormonal times this is my go to. My everyday go to at the moment is Mega Mist by BYBI. The entire BYBI range is amazing - it's all vegan and cruelty free. This mist is full of Hyaluronic acid that makes my skin more hydrated and glowy. At £26, it's more of a luxury cleanser but in my experience, toners last for AGES so it's worth the extra spend for the results. One toner that really changed my skin was Alpha H Liquid Gold. There's so much written about this toner and acid toning online that I'll not bore you with the details. Acid toning basically is like a liquid form of exfoliation so it's toner with extra punch. For me, Liquid Gold helped to dull so many of my acne scars and improve the overall texture of my skin. Acid toners aren't for everyone but for me, Liquid Gold was a game changer that I would highly recommend. Don't skip on toner. Add one in to your routine - pick up a simple rosewater or mist and go from there! My favourite part of the day: taking off my making and cleansing my face. Let me make it clear that taking your makeup off is very different to cleansing. I liken it to doing your floors at home. You brush off any dirt - i.e. take the rough off like taking off your makeup. Going in with a makeup remover or micellar water is perfect for this. I always do this bit with cotton pads as it helps you to see how much you've got off! 2 - 3 cotton pads later, I go in with cleanser. This is like mopping your floors! If you continue just to brush and not mop, you're going to have some deep dirt in there! Cleansing is so important, particularly if you wear a heavy foundation. Stockpile on face cloths - they are so cheap so make sure to use a fresh one every day for the ultimate cleansing experience. An amazing product for the price. It easily melts makeup away on both your face and eyes (I love anything you can out on your eyes too!). I love to double cleanse with this if I have a heavy makeup day. A great cleanser for all skin types. This is my 'oh my skin feels a bit dirty' cleanser. Maybe you're having a busy week and your skin hasn't been your priority. This is a foam cleanser (which I have to admit that I usually don't like!) but as the name suggests, this cleanser gives a lovely deep clean resulting in a post cleanse glow! I recommend this for dull skin and particularly like to use it in the winter months. This is a recent addition for me. Full of 'good' ingredients, this gel cleanser leaves your skin squeaky clean. This is my go to on days I haven't been wearing much makeup or for a second cleanse. Good for normal & oily skin types ... and great for men and women (and any teenager you might have in the house!). An all rounder! One of my original favourite cleansers. My preference is always for a milk or an oil because I feel they are nourishing and gentle on my skin. The Yon-Ka cleanser is again great for all skin types and leaves your skin soft. I've been using this cleanser for over 5 years and continue to repurchase it! Plus a bottle seems to last for ages! In summary - find a cleanser that works for you! I've tried hundreds over the years but you know your skin best. Make sure your cleanser makes your skin feel clean but not tight. If you notice makeup on your pillow cases, a double cleanse might be required for you. Cleansing is the most important step in achieving your skincare goals - start as you mean to go on! It's the posts you've all been asking for... skincare! Over my past almost 8 years blogging, I've talked about skin and products endlessly. However, I'd say it has taken until the last year for me to get my skincare routine down to a tee. It's been a lot of trial and error but mostly, learning what my body responds to from the inside out. I decided to do skincare justice that this will be a five part series, starting with understanding the key thing that has made a difference to me. Learning what causes your skin flare ups has been key to me making my skin so much better. Hopefully my advice will resonate with you. I'm not a skin expert (but I promise I'll tell you who my fab people to go to are in this series!) but I feel like I've learned so much that I wanted to share it with you all. My posts are hopefully designed to make you think and devise your own skin solutions. It's a pretty obvious one. Always get a bit spotty around your time of the month? It's a very obvious warning sign of your impending monthly visitor. Hormones can also play havoc with your skin in pregnancy and menopause with lots of people reporting excess oil or extreme dryness. For me, I always get one 'period spot' on my chin ahead of my time of the month and tend to be a little bit oiler - the oil will account of the spot. Using products tailored to helping excess oil in your period week can really help get this under control. This is the BIGGEST skin disruptor for me. For years I couldn't work out why my skin was playing up but taking time to asses it, stress can make my skin go haywire. In fact, this year when I was moving jobs and moving into my house, my skin completely exploded. I wasn't taking time to look after my skin, remove my makeup properly and I wasn't eating well. All of these stress factors contributed to my skin looking dull and spotty. Self-care is key to this one - take time for your skin even when life gets really busy. The warm and cold can cause skin to have a little freak out. Particularly if you are going from one extreme to another, your skin may get really tight with dryness. This is a great reason to go for a seasonal facial to address any skin concerns you may have and to update your products from season to season. Along with stress, water is the other big factor for me. Ideally, my skin likes 3 litres of water a day. This seems like a lot but the more I drink, the clearer and more plump my skin will be. It means I pee 20 times a day, but it's worth it for good skin! A controversial one but I've been taking some supplements that I have felt have really helped with my skin texture and overall glow. Firstly, the Clear Marine Krill Oil is a great supplement for helping those hormonal breakouts. I also found it really helped with my PMS symptoms. I have recently started trying out Nature's Bounty chewy multivitamin gummies (available at Medicare) - both the collagen and biotin versions. I've noticed hair growth already with the biotin ones and find they are a really easy way to get in some good skin boosting ingredients such as Vitamin C to help with brightness. Injectables.... botox, fillers... are HUGE business right now. It's something I've watched a meteoric growth of in the past five years where now, going to get your botox is as normal as a teeth cleaning at the dentist. The growth of injectables has made me really assess if it's an option I need to explore. I know many of you have come to this post probably hoping for me to confess what I've had done but short of the odd heavy duty skin peel, I've never done anything invasive like injectables. There's an abundance of people offering injectables at the moment which scares me a little. It's quite like the dodgy hair extensions epidemic of a few years ago. It isn't a tightly regulated business and people doing injectables seem to be popping up everywhere. The cost can vary from £50 to £500 and you can go everywhere from your dentist to your local hairdressers down the street. The rise of injectables has given me reason to look at my own face and think about what I would improve. Do I need bigger lips? Do I need my brows lifted a little bit? Do I want Khloe Kardashian style jaw fillers? I have never really felt insecure about my face. In fact my face & my legs are the only two things that I feel I wouldn't want to change. But, when something becomes so popular, regardless of what your own thoughts are, you start to indulge in 'Should I join the crowds' mindset. It's a fear of missing out - despite the obvious cost and pain involved! I'm not running down injectables because they certainly have their place & have given lots of women and men the confidence they really desired. If you choose to do it, go to someone who is professional and you've seen lots of their work that has come out beautifully. Part of my confusion around injectables has some from so many companies approaching me to offer me free injectables to promote their business. I found it was a strange pitch because my ultimate reaction was 'Well they must think I need something done if they are offering these to me'. But I suppose that's the point - I feel like I need something so I go to that business and give them publicity. But that scares me too - what if I hated it? What if I sent you all somewhere and you had a bad experience? This isn't just a manicure that you can take off with remover, you're actually messing with your face. I've made the decision that if I ever want to get something, that I'll do it on my terms paying for everything with someone I trust. I've had the injectable chat with a few practitioners - two of which told me I had a lovely face and they wouldn't change a thing. I found this really decent because the easiest thing would be to take my money. Ethical practitioners are a gem to find - seek them out. So, if you are in the same mindset as met give yourself a break. If you really want something done, go for a few consultations an weigh up your options. Although injectables aren't a life long commitment, I do feel that they start an addiction once you've seen the results. Be wise and be kind with yourself - do you really need injectables or are you following the crowd? I'm 26 and I don't have any wrinkles or creases yet. Perhaps when that day comes, I will feel differently. So whether that day is five or fifteen years down the road, I will still apply my own rules of going for a few consultations. Do you research, ask all the questions and ensure you are 100% comfortable before you embark on anything. I love a little overnight away to recharge my batteries and there's nothing better than a super quick trip to Dublin! I love Dublin because it feels a million miles away when really, it's only just down the road! Getting to Dublin is easier than ever with Dublin Coach. Hop on the coach next door to the Grand Opera House on Glengall Street. The service leaves every hour and gets you to Dublin in 2 hours. Unlike other services, the coach runs directly from Belfast to Dublin City Centre, dropping off at Dublin's Custom House Quay. The coach has USBs and WIFI for charging and browsing plus the seats are big and comfortable. The two hours flew in! Plus it's only £8 each way - bargain! I can highly recommend the beautiful Westbury Hotel, located just behind Brown Thomas. It's a really stunning hotel and so handy if you are on a major shopping trip. My favourite hotel (actually in the entire WORLD!) is The Merrion Hotel. It makes me feel so happy as I have very fond memories of a trip when I was a teenager. It's really homely and they have a fabulous spa in the basement too! On this trip, we stayed in the brand new Iveagh Garden Hotel. It's Europe's first sustainable hotel and it's powered by the river that runs underneath the hotel. The hotel is really gorgeous - very modern and glamourous. It's a great place for a girl's trip and their bar & restaurant, Elle's, does amazing cocktails. I've also heard great reports of House Dublin - they've also just opened up a sister Belfast version on Botanic Avenue that's worth a nosey. I always head straight to Brown Thomas to look at all the gorgeous things and visit the babies in Chanel and Louis Vuitton! I also really love Armani makeup and Huda Beauty. Two of my favourite brands are a big reason why I venture to Dublin - COS and & Other Stories. Their clothes fit me so well - fellow tall girls take note. There's also a new Victoria's Secret in the old BT2 unit. It's really big and has a whole downstairs of the PINK collection. If you want to explore some amazing Irish design, head to the Kilkenny Centre. They really champion local makers in everything from ceramics to jewellery. After asking you all on Instagram, Fire on Dawson Street came out as the top rated place to go. We headed there for an amazing meal - delicious steaks and the BEST PRAWNS I've ever had. The service is also fantastic. Highly recommended also came Sophie's at The Dean and Roberta's. I can also really recommend The Green Hen from previous visits. We headed to The Woollen Mills Eating House for lunch on Saturday. They serve amazing lunch options from sandwiches to burgers. The restaurant is really chilled - a lovely juxtaposition to the location facing the busy Ha'penny Bridge. If you want some shopping fuel, make sure to grab a hot chocolate from Butler's Chocolate Cafe - the best! Feeling inspired? Plan your perfect trip with Dublin Coach by visiting there website here. The start of this year has been an absolute whirlwind. Not only did I move to a new job but I moved into my first home! I've been saving for and working towards my own house for quite some time so I was delighted that I finally was able to make my dream come true! It's super hard saving for a deposit and also gathering up stuff for a house but I regularly frequented TK Maxx to stock up on essentials for my house - from my pineapple doormat to pots & pans! I feel like it's been such an amazing place to find both great value and one off gems that you know that no-one else will have. My local TK Maxx in Newtownabbey has a HUGE furniture section with lots of homeware goodness. As I've mentioned before, I do travel for a good TK Maxx find - a wee day trip to TK Maxx in Ards or Lisburn has also landed me some amazing finds! A little pro tip is to go in the morning, especially mid-week if possible! They seem to get great deliveries then! Here's my top three picks that you need to look out for on your next TK Maxx adventure – and if you are anything like me you’ll find it hard to simply stick to these three things! Buying lamps was something I didn't realise was such a substantial task because you need SO MANY OF THEM! You become obsessed with finding really unique lamps and also feel super triumphant when you score an amazing pair of matching lamps for your bedside tables! I picked up the amazing gold & marble lamp in my local TK Maxx and it perfectly complements my jewel toned living room. Also I've picked up lots of really great lampshades for affordable prices - another thing that you don't realise you need lots of! Make sure to take a look in the homeware clearance aisle – there’s always some amazing lamps and lampshades there! So fun fact about me: I'm really weird about candle ingredients. I'm a huge fan of soy candles both for their ingredients and their longer lasting burning time. Typically soy candles can be much more expensive but I always pick up amazing ones in TK Maxx which are great value. I've got everything from fresh cotton scents to gin & tonic! Warning: your friends will love them so much that you will end up buying loads to give out as gifts! My grandmother is now hooked after giving her some for her birthday & Christmas! I’ve picked up some of my favourite designer candles here over the years too so be sure to look out for some big names amongst the shelves! My biggest spend since moving into my house has been on prints & photos to dress my house. I love black & white portraits, especially of old Hollywood icons! There's always an amazing selection and I have managed to buy one for almost every room of my house at this rate. The best bit is that you get the print/photo plus the frame. Most of my choices have been around the £30 - £50 mark, making them super affordable. I also have picked up some beautiful framed quotes for just £10 - a great way to dress an empty corner or bathroom. Let me know what your favourite TK Maxx finds are - I always love to discover new things. I love to lunch. It's one of life great pleasures. But often, I love a cheap and quick lunch. An hour, something tasty that won't break the bank, all whilst catching up with a friend on my lunch break. I have 3 amazing options that you won't want to miss out on! Let me make this clear - Green's is the BEST pizza in Belfast. I've tried them all but I've been going to Green's for years and it continues to be the best. Not only is it the best pizza but their staff are lovely in both the Lisburn Road branch and the Ballyhackamore location (plus they are soon to open a third branch on the Ormeau Road!) Their lunchtime deal has pulled me out of many a bad mood and hangover. You get half a pizza & either house salad or garlic bread AND A DRINK for under a £8. It's the best deal around! My choice? The Gilroy Twister. Meat, loads of peppers and 2 dips - divine! See their menu or order home delivery here. Oliver's is one of those 'suits everyone' type of restaurants (I also put Howard Street & Deanes at Queen's in this category). 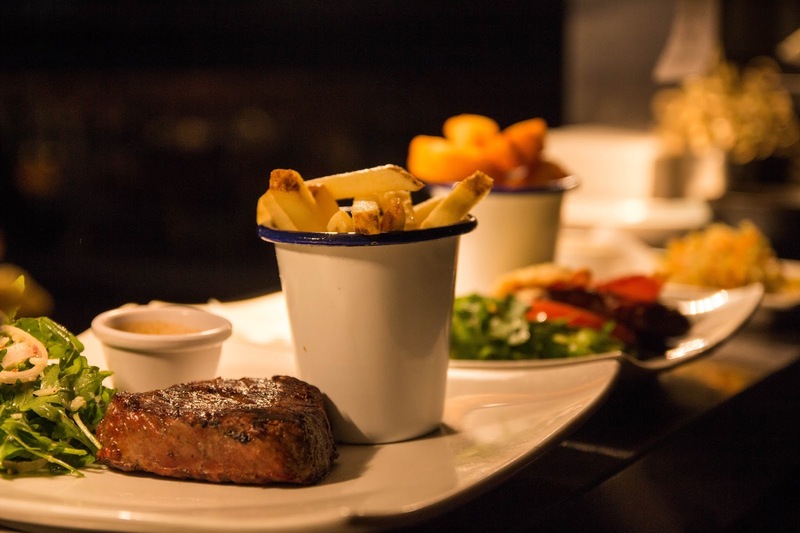 There's a little bit of everything on the menu from traditional fayre to daily specials. The best bit is that it's all super tasty and affordable. I've had a few lunch dates here lately and I love the setting. It's so homely and comforting. Made with lots of local ingredients, the food is hearty and delicious. I've had everything from amazing pulled beef sandwiches to the most AMAZING risotto. To book or to see the menu, head here. The best bit about Bubbacue is that they have 2 branches now - hooray! Botanic Avenue and Callendar Street are super handy for grabbing a bite during work, uni or during a shopping date. I've been a long time fan of Bubbacue for the sheer value - it's tasty food that comes in big portions. I've long been an advocate of their mac & cheese - even if you say you don't like mac & cheese, you need to try it out! I've made a few converts of my friends lately! The owners of Bubbacue are the original Boojum owners so the fact they added a burrito to their menu lately made sense. It's SO yummy - packed with the most divine salsa and cheese ever! See their menu and locations here.